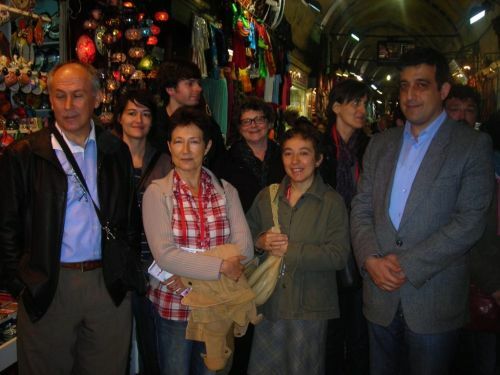 The fourth partners’ meeting of the project Bazaar took place in Istanbul (Turkey) from May 8 to 11, 2011. The meeting has been organised by Provincial National Education Directorate of Eskisehir and hosted in the premise of the Association of Grand Bazaar in Istanbul. Participants in the meeting have been 11 representatives from the partner organisations from Austria, France, Germany, Italy, Turkey, and United Kingdom. During the meeting, partners met with Mr Cem Arica, Secretary General of Gran Bazaar Association. During the meeting Mr Arica introduced the history of Istanbul Grand Bazaar, and its main features of today. Mr Arica said that the Association Grand Bazaar is very much interested in opening up to the e-commerce. That’s why he finds the Bazaar project very important and innovative.